Much to the shock and sadness of Kaley Cuoco, The Big Bang Theory will be concluding its astronomically popular run later this year after 12 seasons, a decision that was due to Jim Parsons’ request to leave the sitcom when his contact expired. 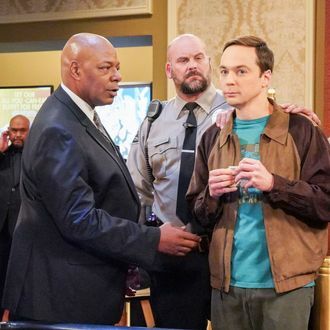 The final season has since been chugging along in normal fashion, teasing some happy endings for the perpetually unlucky-in-love-and-life Raj and Stuart, with Parsons now weighing in on what influenced his decision to depart the show. This isn’t exactly rocket science: His creative fulfillment just wasn’t being met anymore, especially when you factor in all of the Broadway plays and acclaimed dramas he’s been doing on the side. I guess at a personal level, it feels like the right time in my life. I don’t know what’s next for me. It’s not like there is something specific I am aiming for. I’m firmly in my middle age now. I don’t know how much longer I can wear [the T-shirts] without looking really long in the tooth. In a way, it’s exciting. What is this next chapter of life? What is this next chapter for all of us? It will be very, very sad when it does end, even knowing [I am] okay with it. People are okay when they graduate but there are frequently tears at graduation. It’s hard to say goodbye to people that you have worked with for so long. We have a few months until we say good-bye to Sheldon and company for good, so start brushing up on those Soft Kitty melodies in the meantime.